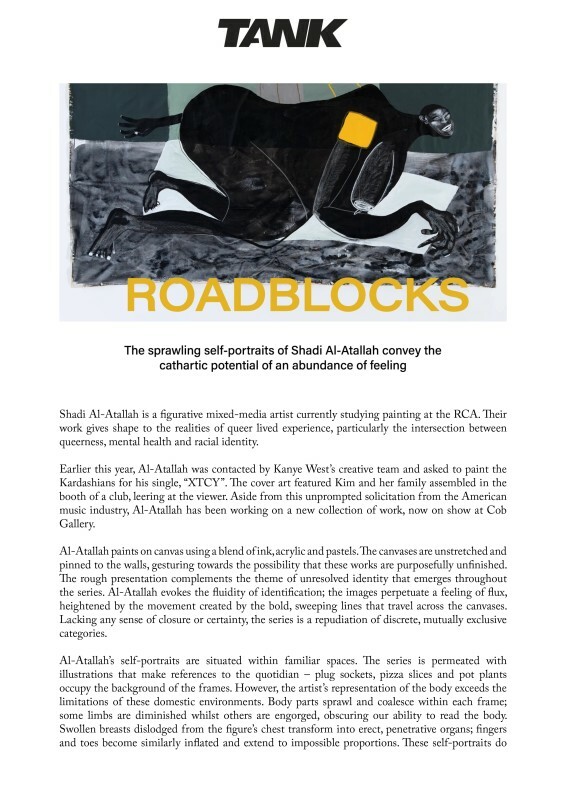 Shadi Al-Atallah is a figurative mixed-media artist currently studying painting at the RCA. Their work gives shape to the realities of queer lived experience, particularly the intersection between queerness, mental health and racial identity. Earlier this year, Al-Atallah was contacted by Kanye West’s creative team and asked to paint the Kardashians for his single, “XTCY”. The cover art featured Kim and her family assembled in the booth of a club, leering at the viewer. Aside from this unprompted solicitation from the American music industry, Al-Atallah has been working on a new collection of work, now on show at Cob Gallery.